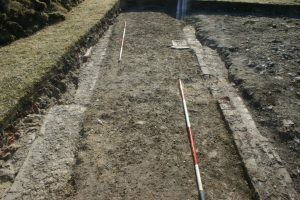 The oldest part of the house seems to have been at the front (Croydon Road) side which was mostly outside the 2012 trench. We therefore plan to dig a large new trench 6m by 9m on the south side of last years main trench. We aim to excavate the 19th century demolition deposits and expose the foundations of the earlier building. We hope that this will produce more information on the early history of the house. Today we set out the trench, erected the fence around it, took the turf off and began the removal of the top soil. I was not expecting any significant finds today and there probably won’t be much tomorrow. I am hoping things will get more interesting on Wednesday. We have continued with the removal of the top soil at a rather slow pace dictated by the heat. 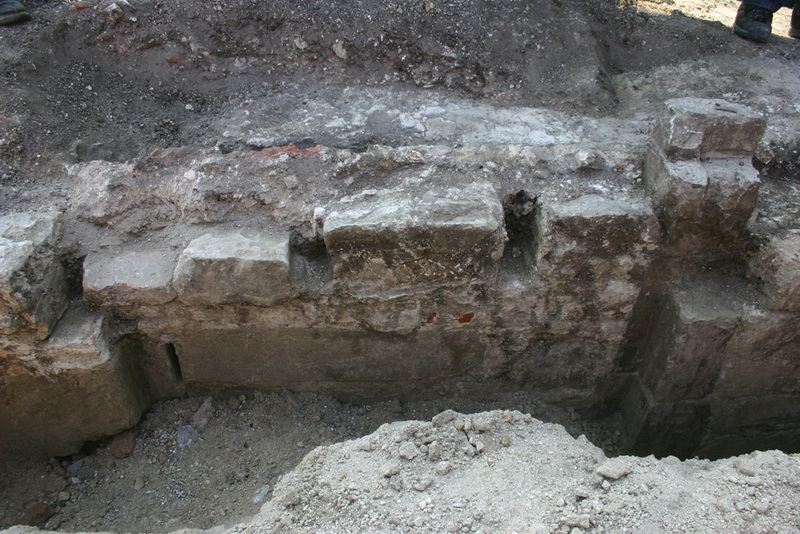 The deposit is not yet fully excavated but part of a brick foundation has emerged. This is more or less where I expected to find the south wall of the house but we need to see more to be certain. Work continues tomorrow. Slow progress in the heat. At the end of the day we have still not cleared the top soil. At the end of the day we finally finished clearing the top soil. The floor of the trench is now covered with a mass of demolition rubble. We will start excavating this tomorrow and things should get more interesting. We found two pieces of flecked tin glazed tile of late 16th or early 17th century date. They are similar to the ones we found last year although the pattern differs slightly. The trench at the end of the day. A section of foundation can be seen centre right. 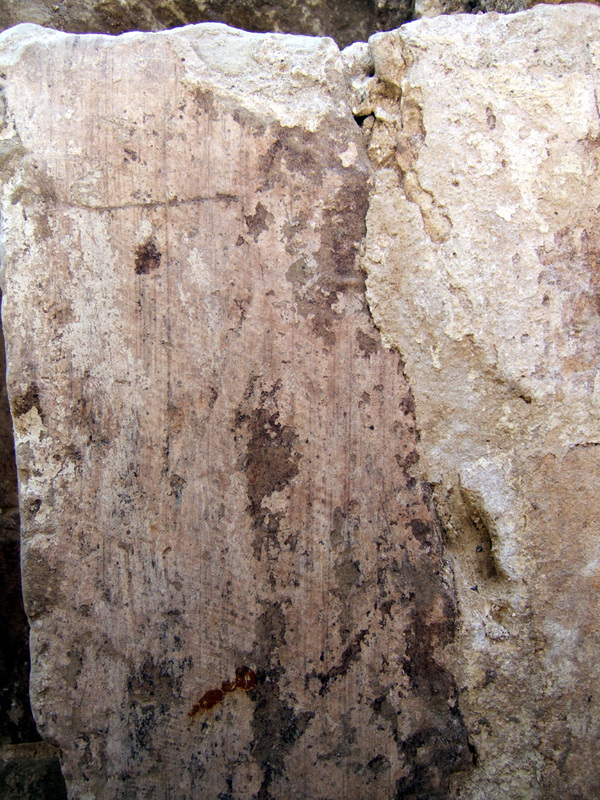 This was probably the outside wall of the house. If so the photo looks from outside inwards. Most of the trench floor is covered with demolition rubble. Things have become more interesting today. We excavated the rubble to the south side of the foundation. I thought the foundation was the front outside wall of the house. We found a drain and gravel surface which could be the edge of the drive at the front of the house. This fits nicely with the interpretation of the wall. 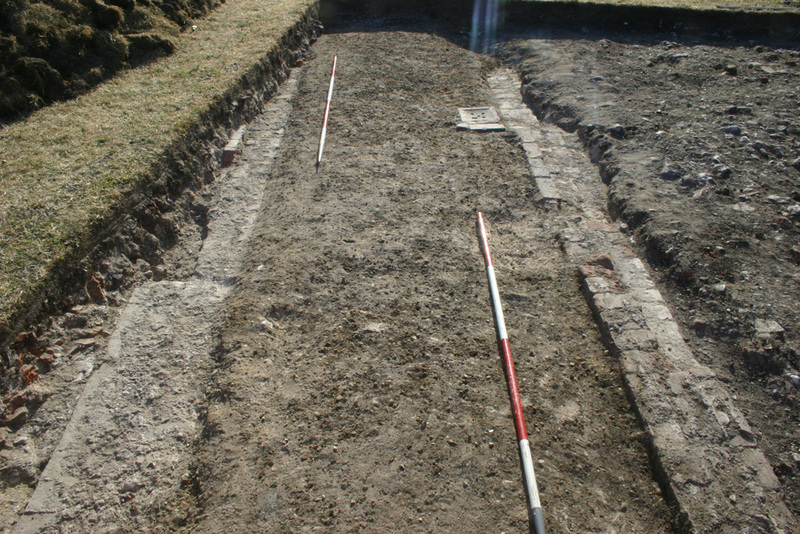 However, we also found a second wall parallel to the front wall right at the southern end of the trench. The south end of the trench. 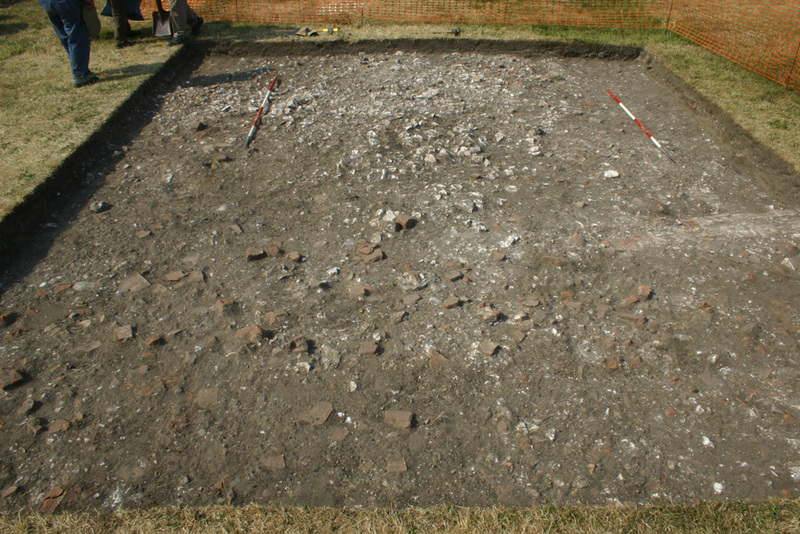 The scale is on the gravel surface with the foundations of two walls to the left and right. The drain can be seen beyond the scale to the right. This is rather puzzling. It looks as if we have got two outside walls. It is possible that a new front was added to the house but this is very uncertain. In the next few days we will find out what is under the gravel which should clarify the interpretation and perhaps help with the dating. Yesterday we uncovered a gravel surface and drain between two walls at the south end of the trench. The aim of this is to try to find out when the gravel was laid and also to examine the history of the ground on which the house was built. 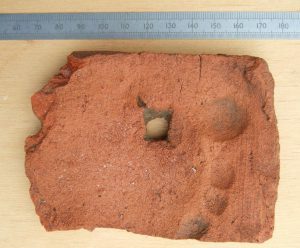 We found that the gravel rested on an area of mortar which looks as if it was laid down when the northern most of the two walls was constructed, probably in the 18th century. 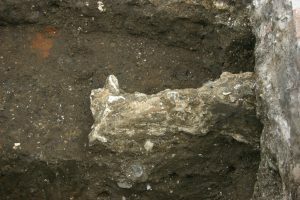 The mortar appears to rest on an earlier layer of gravel which we intend to excavate tomorrow. Hopefully we will then get some better dating evidence. We also excavated at the north end of the trench and have so far uncovered a small part of the floor foundations within the house. There was one particularly interesting find – a small piece of Reigate stone with a symbol carved on it – apparently a cross in glory. This Christian symbol seems appropriate as the building was the home of the rector of Beddington from about 1600-1800. The carving may, however, be medieval. We continued excavating between the walls at the south end of the main trench. I expected this to pass through the foundations into the underlying soil where I hoped to find some finds to give us a date. 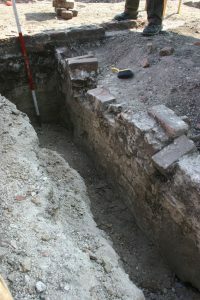 I was surprised when a north south running foundation appeared passing below the 18th century south wall of the house. This must relate to an earlier building. The finds from the soil around this foundation suggest that it is late mediaeval – perhaps 14th or 15th century. I am still thinking about the implications of this. 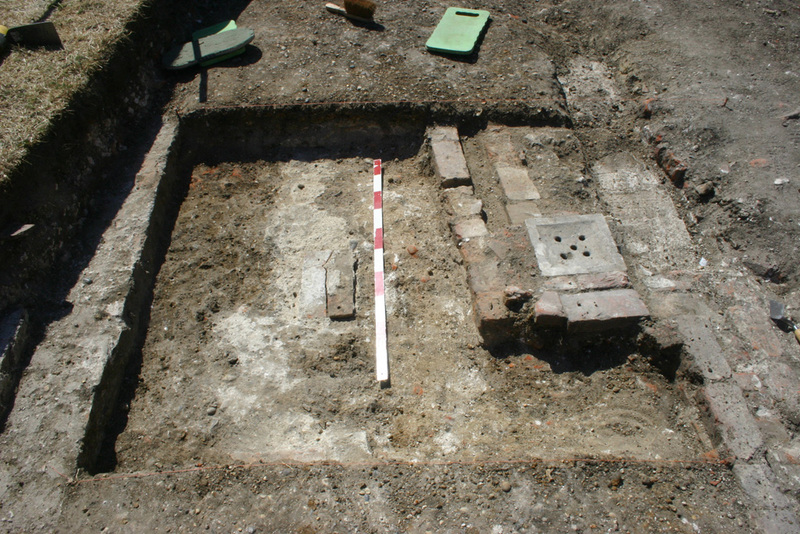 We also continued to excavate at the north end of the trench within the 18th century. Here there appears to be evidence for a timber floor unlike the tile floors we found on the north side of the house last summer. It looks as if the good living rooms had wooden boarded floors while the servant’s areas were tiled. There was one very nice small find – a piece of roof tile with the impression of a child foot. A passing parent matched the size with her own 2½ year old. 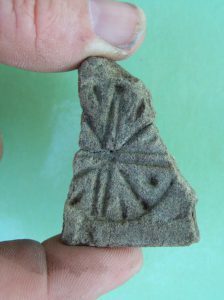 Medieval roof tiles were moulded from wet clay and then left to dry before firing. It appears that a small child walked barefoot across the wet tiles. The context suggests that this happened in the Middle Ages – perhaps in the 14th of 15th centuries. We have had a big surprise today. We continued excavating in the east side of the trench. I was expecting to find a cellar continuing from an area we had excavated last year. The cellar duly appeared but the wall did not look 17th century which is what I was expecting. It looked very medieval. There was also a large blocked door which showed that the cellar once extended westwards. It was probably filled in the 18th century as the blocking looked that sort of date. The wall is well made of Reigate stone and is clearly a quality job which should belong to a substantial and expensive house. The most likely person to have built the wall is Adam Houghton who occupied the house from 1357 to 1361 when he became Bishop of St David’s in Wales. He is know to have rebuilt the house and probably had the money to pay for quality work. However, cellars are unusual in houses of this date outside towns, so our find is odd and the interpretation of it will need some thought. We are going to do some detailed examination and recording tomorrow which will hopefully produce a little more evidence. We have done very little new excavation today as we have been recording what we have uncovered. This involves a detailed look at the structures and often results in further discoveries. We found a couple of significant things today. The most important is that the earlier of the two 18th century front walls rests on earlier foundations although I am not at present certain how much earlier. It is becoming clear that the house had a very complicated structural history which will probably become clearer as I work through the evidence we have generated. 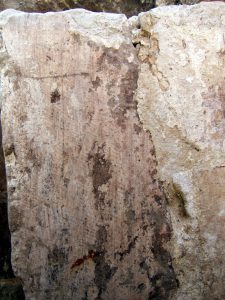 The second find is a simple cross scored into the stone on one side of the cellar door, perhaps to keep out undesirable spirits. We have now started backfilling the trench. We are not working tomorrow so there won’t be a report. We will be on site on Wednesday when there will be more recording and backfilling and perhaps some further discoveries. We finished the recording today without making an significant new discoveries. We have now started backfilling and the foundations and features are already covered. We hope to finish filling the trench tomorrow and it will be reseeded when the ground is damp enough. This is the end of the daily reports. I now needed to bring the results of this excavation together with last year’s to produce a report on what we have found. The interpretation of the building is going a need a good deal of thought.